Congratulations to Beat Schmid, Gene Dukes, Connor Flynn, John Hubbe, and Celine Kluzek who received the prestigious 2011 National Aeronautics and Space Administration Group Achievement Award. As part of the 4STAR Development Team, which included collaborators at NASA, this team expanded the scientific, engineering and aviation capabilities for sun and sky tracking measurements. The award was given out as part of the 2011 Presidential Rank and NASA Awards Ceremony at the NASA Ames Center in California on August 17. "This is one of the most prestigious awards a group can receive, and is presented to selected groups who have distinguished themselves by making outstanding contributions to the NASA mission," said S. Pete Worden, Director of the NASA Ames Research Center. 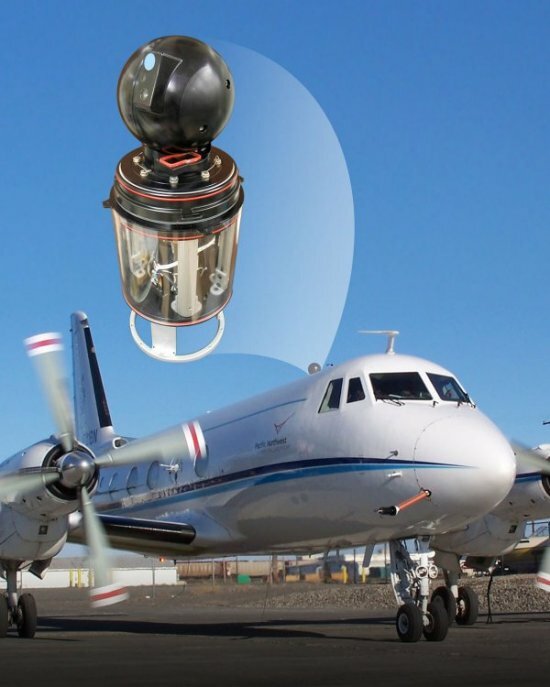 The instrument called 4STAR, or Spectrometer for Sky-Scanning, Sun-Tracking Atmospheric Research, looks like a bowling ball sitting atop the PNNL G-1 aircraft. With the optical collector trained on the sun and sky light, the rest of the instrument is below in the aircraft cabin, collecting and sending data through fiber optic cable to on board light-measuring instruments. Challenging scientific and instrumentation problems were solved by the team. They designed the instrument to collect important information on atmospheric aerosols and clouds contained in the direct and diffuse solar light within strict calibration requirements, during all sorts of aircraft maneuvers, cabin pressure fluctuations and signal transmission variations. And they did all this while achieving the strict FAA airworthiness certification. "4STAR worked not only from an engineering point of view, but it proved its airworthiness and married two light-collecting concepts into one compact instrument," said Dr. Beat Schmid, PNNL atmospheric scientist and team lead. "The NASA group achievement award honors our collaboration and scientific effectiveness."